Common names: Purple Laurel, Rose Bay, Catawba Rhododendron. R. catawbiense grows in the wild in the mountains of Virginia and West Virginia to Georgia and Alabama, occasionally eastward to near the coastal plain. They are evergreen shrubs or small trees. Leaves are thick, leathery, dark green above, pale green beneath, shaped oval or elliptic, 2" - 5" long. Flowers held in an umbel-like cluster, colored rose-purple to lilac, rarely white, with olive-green spots on upper lobe, not fragrant. Flowers bloom in May and June. Calyx lobes broadly triangular or semicircular, less than 1/3" long. Corolla rotate to campanulate shape, up to 2 1/3" across. Ten stamens; filaments purple, anthers white. Purple style about as long as stamens. Cold hardy to -25°F ( -32°C). Widely used by hybridizers to create cold-tolerant hybrid varieties. R. sargentianum, a dwarf rhododendron, was first introduced in 1903 by plant explorer Ernest Wilson who found it when he was hunting for plants in the mountains of western Szechwan, China. He found it a few other times growing in the same locality, in exposed areas, at elevations of nine to eleven thousand feet. This is an ideal plant for a rock garden, or tucked into a little niche in your garden, because at maturity the plant is such a little gem. Plants grow to about 18 inches tall and about that wide; there may be some larger than that, but I've never seen one. They grow slowly but start blooming as small plants. Sometimes plants grown from cuttings will start blooming within two years. It is a twiggy compact plant with small aromatic leaves that are shiny green on top and densely covered with tiny rust colored or dark brown scales. Typically this rhododendron species will bloom in April or early May. The flowers are small, narrowly tubular with spreading lobes that are held in little trusses of five to seven flowers. The flowers are either white, pale yellow, or lemon yellow. The yellow forms are in greatest demand, but many folks prefer the clones with white flowers. This is an alpine rhododendron and, like most alpine rhododendrons, it is absolutely essential that it is grown in a medium with good sharp drainage and in an open location. However, try to provide it with afternoon shade, as it doesn't seem to like the hot sun. 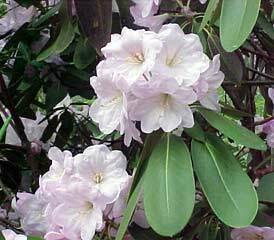 R. sargentianum is one of the finest dwarf rhododendrons you can have in your garden. 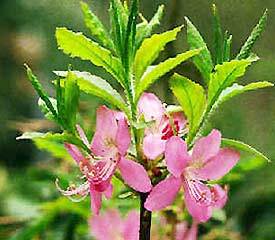 In the spring it will cover itself with a profusion of flowers and when it is not in flower it is still an attractive little shrub. Don't forget that fragrant foliage! 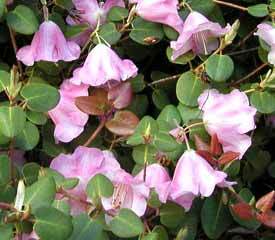 R. sargentianum does not look like a "typical" rhododendron and will be certain to add interest and variety to your garden.